Voice over Internet Protocol (VoIP) technology has helped drive down the cost of monthly service while offering all of the bells and whistles of more expensive traditional options. But until recently, most telecom service providers paid little attention to the small business or micro-enterprise market with fewer than 20 employees. Today, though, there are a handful of companies addressing the needs of the small business market with hosted PBX solutions that offer feature-rich, flexible options at a considerably lower cost than previously available choices. 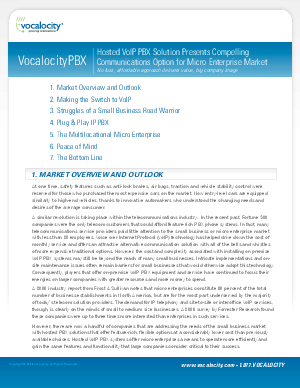 This white paper investigates how a hosted VoIP solution can be an affordable approach that delivers value and a big-company image for micro- enterprises.